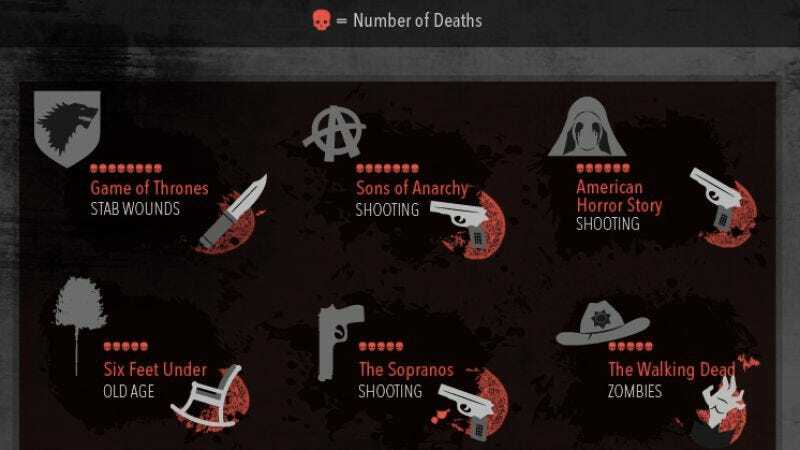 How are TV characters most likely to die? As our TV dramas get more dramatic, the deaths of prominent characters continue to rack up per show. But how likely are main characters to die on deathmongers like American Horror Story, Game Of Thrones, or Grey’s Anatomy, and in what way? Some TV watchers, apparently with a lot of time on their hands, compiled the stats on TV deaths over recent years, and created several helpful graphics. Perhaps the most heartening stat of all: On a show that practically featured death as a main character—Six Feet Under—the most common cause of death was relatively benign: old age.